This morning I taught her how to write the letter "A". 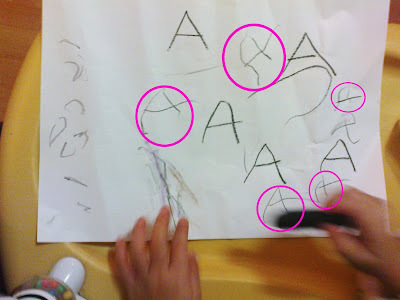 She usually makes alphabets-like scribbles on pieces of papers & will say "I am writing A, B, C!". Usually it is just C that she writes but today I decided that maybe I should teach her to write "A". She learns very fast.